A community meeting was held last night (Tuesday 11th March) at Misty Bar which gave forum to the heritage objections that are available for all those interested in objecting to the proposed planning permit – 2013/009973 covering the Forum Theatre and the site immediately behind it. The following items were discussed to inform those who wish to proceed with submissions & objections. Members of Hosier Inc were present among the wider community. Those of you who choose to submit an objection are urged to include as many of the points outlined below as you feel are of concern, but also include any additional personal, public or location-based objections that we all may have – just remember to use a heritage objection in our objection so that it is relative to the objection requested by the planning permit. Lack of community consultation by the developers and the proposal in its current form fails to address a range of community concerns. The DA application documents (download the 11Mb pdf of the concept) demonstrate that the scheme up for approval is not to the benefit of anyone who currently works, lives or plays in the lane way. We’d even go further and say that the scheme is not beneficial to the developer – it has the potential to harm their brand, and may in fact under value the property by proposing a scheme which is clearly under cooked. In its current form the scheme fails to consider a number of key issues, particularly in respect of the Hosier Lane interface, community & history. The Heritage overlay that encompasses the area has a discretionary height limit of 40m, but the proposed development proposes to reach 106m. 1. a) The proposed demolition of the historic Russell St theatre will remove the last remaining Robin Boyd structure in the CBD. 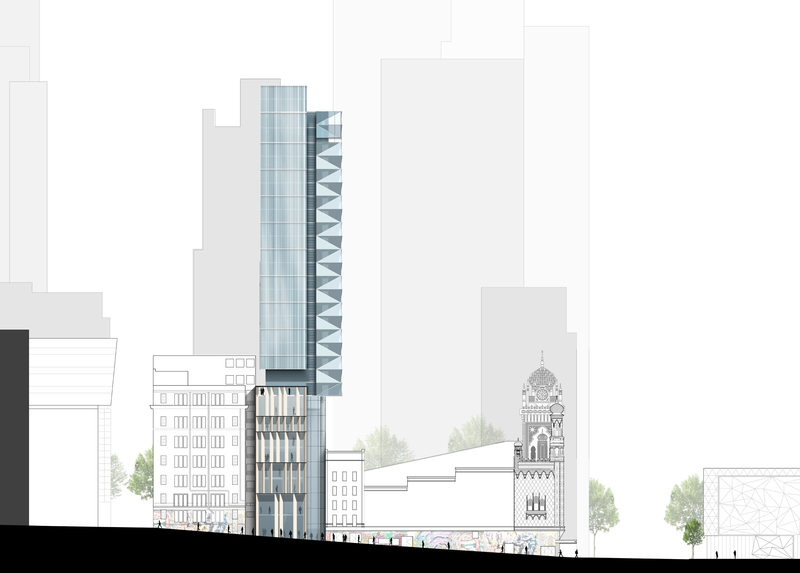 This proposal will deliver sheer faces on all four sides, breaking the longstanding convention of ‘podium and tower’ style buildings and setting a very bad precedent for future developments. 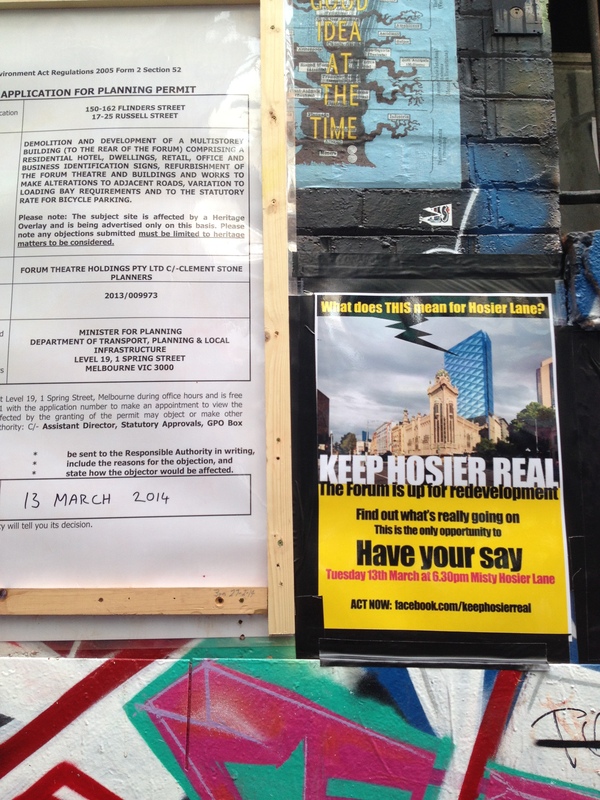 The traffic report within the proposal does not adequately explain how pedestrian & emergency services access and ingress will be managed in Hosier Lane, and proposes all loading for the hotel, commercial and residential activities will take place from a loading ‘dock’ adjacent to the new building in Hosier Lane. 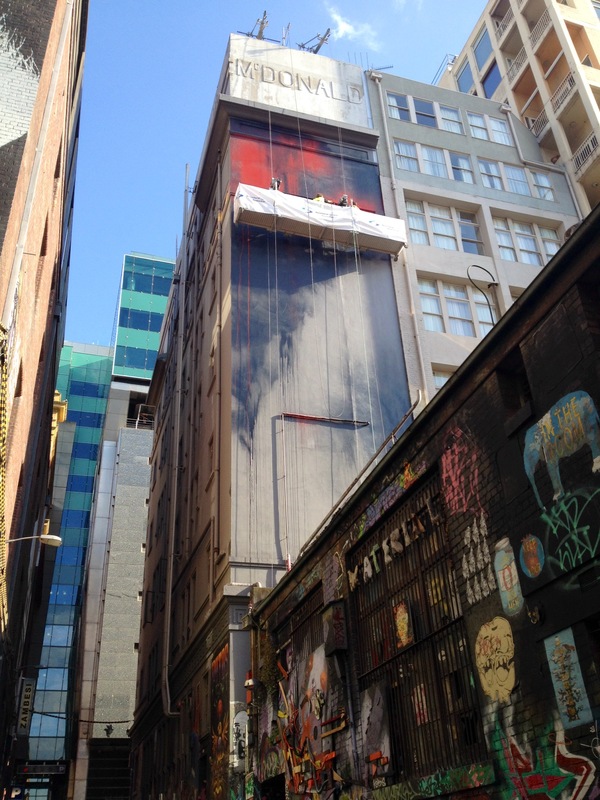 Hosier Lane has an internationally respected art culture — using the current lane way for marketing for the new hotel is not going to be sustainable and it is anticipated that the new hotel will impact adversely on the nature and vibrancy of the culture of the area. Combining the proposals for the purpose of side-lining the council is not acceptable. The proposed hotel development has the potential to change the amenity of the area and will influence the activities that will be possible in adjoining properties. The proposed development will significantly impact the surrounding heritage properties, vibration from plant, overwhelming visual impact and encroaching on airspace. The interface between the new building and Hosier Lane is not consistent with or sympathetic with the current conditions and use of the space. The space would be better suited to a development that addresses the real needs of the local area. The complete overshadowing of the Atrium will impact significantly on this ‘Winter Garden’ that is integral to the design of Fed Square. Talk to everyone if you want your opinion on this application to be heard. The heritage height limit which is discretionary for this zone is ; 40m, the proposed hotel building is 106m – no brainer. – the postage stamp site has been pushed through the boundaries of the heritage limit. Nothing about this site matches or relates on an aesthetic level to the neighbourhood. We have discovered that the Russell St Theatre, the site of the new building, is actually a Robin Boyd redesign (from an original church, so a major redesign). This makes it of great architectural significance, it would be the only Robin Boyd building left in the CBD. Although we are unsure of the current condition of the interior, it is of significant importance and should at the very least warrant scientific investigation and potentially preservation. It is also of very real significance to the Melbourne community as the home of Australia’s first professional repertory theatre. This may be a reason NOT to demolish it and to use the building as a point of history for Boyd and his influence on other architects – notably Roy Grounds who is of particular significance to Melbourne. We could ask the Planning Dept to request a full investigation of the site prior to considering the application to demolish. Are there any actors ready to take the challenge of championing this cause who have worked in this site? This is a small boutique site with interfaces on all four sides that will be affected by all provisions in the scheme – In your objection, please try to relate this to the Hosier Lane interface. 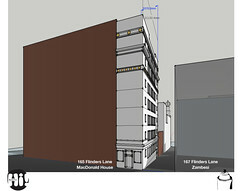 Development in Melbourne’s lane ways has been encouraged to utilise setbacks and a podium style approach to retain the unique character and scale that makes these places so important to the fabric of the city. This proposal will deliver sheer faces on all four sides, breaking that convention and setting a very bad precedent for future development to follow. The podium tower type does not lend itself structurally to the lane way interface and lacks human scale especially on the eastern boundary that faces Hosier Lane. 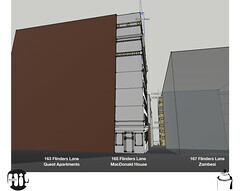 Tall sheer walls are juxtaposing all the current surfaces of the lane way and it is about what would happen in the future as to what should be accepted now – what would this zone look like if several buildings decided to do this type of proposal – it would totally remove the feeling and amenity of the lane way – this is important. There are no set backs, so we will have a sheer wall ; what is this going to be like imposing upon a brick lane way facade and our lives? Please also comment of your thoughts about the nature of the architecture itself. 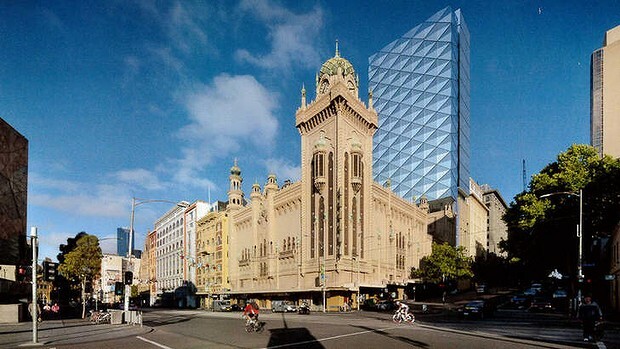 Is this design by a Sydney team ‘right’ in the context of this area? The traffic report in its current form does not adequately explain how pedestrian access and ingress will be managed with the proposed loading dock having trucks ( of what size and load)? pulling up in the lane way to deliver to the new establishment. No specification of vehicle types and what the number of vehicles will be expected to service the new proposed hotel block and no consideration of turning circles and flow on effects in Flinders Lane and Flinders Street due to additional heavy traffic entering and exiting the lane way. The traffic report does not show how these trucks will enter or down load, nor does it confirm the current traffic volume that services the lane way – the existing businesses of The Living Room, Misty and Movida are not mentioned nor is their current schedule of deliveries or pick ups including ambulance 24/7 requirements in the case of the Living Room? Vehicular traffic in Hosier Lane is already very restricted due to the considerable amount of foot traffic that uses the lane way at all hours. Approx 1000 pedestrians each day would be in danger if additional loading and delivery vehicles were imposed on the space. Due to the lack of footpaths and genuine attraction for sightseers, consideration should be made to making this a pedestrian zone… this is an avenue to explore with Council engineering. The 5 car drop off area in Russell needs to be reconsidered for dual purpose loading zone. If the weight of the trucks using the lane way for delivery is not listed, we cannot be sure that the bluestone blocks that currently make the cobblestones of the heritage lane way will not be dilapidated with the constant wear and tear from all of the new use of the lane way. Hosier Lane has an internationally respected art culture — fundamentally the development proposal in its current form will adversely affect the social & organic processes developing in the precinct. The art included in the proposal is commercial and privately driven. This type of installation bears little resemblance to the character of the lane way. The proposed streetscape clearly compromises the current street culture & fabric. The notoriety of this area with its current tourist trade & affiliated businesses will surely be adversely affected. Using the current lane way for marketing for the new hotel is unlikely to be sustainable. It is likely that the new hotel will soon cause the lane way to change for the benefit of the new tenants. The lane way may lose its organic nature, and therefore losing it’s street art following and consequently risking a huge tourism draw-card. 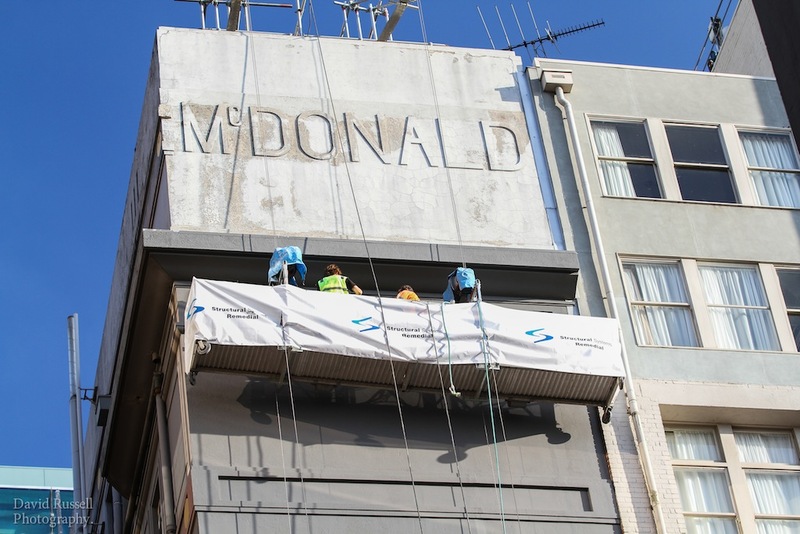 The Forum is not being renovated, only maintained and we are expected to accept this as the pay off for the owner actually doing their civic duty as owners of a heritage building. Utilising the floor space to combine the proposals for the purpose of over reaching the council is not acceptable and the State Government need to have a survey done of the area so that they understand all the items that have not been addressed in the proposal — from waste management, delivery, culture and amenity not to mention the current social consciousness of the lane way and its recreational users. The community benefit is a superficial restoration of the exterior of the Forum, and will pay a huge cost. The trade-off for very little is that the lane way will have to cope with an incredible change to what is currently accepted as being REAL. All of the community want the lane way to be lively, active and safe. However, it needs to work for all involved. At present we are all owners and custodians of the place at this time and need to be involved with the process of transformation for any new purpose that the lane way is asked to be part of. The development proposes to ‘activate the lane way. The current numbers of visitors to the area really makes this point moot. Any additional visitors that the development brings will add nothing to the amenity of the area, but may actually detract. The architecture does not act with responsibility being built at the back of building where the base levels from the live music will cause intense vibration to the whole front surface. This again imposes on the already operational and accepted living standard in the lane way. It is anticipated that this may cause the live music of the Forum to cease (or be compromised) and the interior of the theatre to be used for a different purpose — closing one of the last real live music venues in the city. The sound engineers report (as part of the development documentation) suggests that sounds from the Forum Theatre will exceed the maximum levels for the hotel unless special glass is specified as well as background sound masking. It is noted in the report that the noise impact testing was taken on January 29th 2014 and the testers were advised that the band playing was typical for operation of the Forum Theatre. The band playing that night were the ‘Chvrches’, a synth pop band with little to no base and synthesised drums. Hardly a typical band for sound testing. (see here http://www.youtube.com/watch?v=96oINaQ0T7k) It’s the base sounds that are the long-range sounds that cause issues as shown in the report. The hotel is +17 decibels over the maximum limit for base sounds on the exterior, a huge amount. It is our opinion that even if the construction manages to reduce the base sounds to the maximum level allowed it will still cause complaints from the hotel. 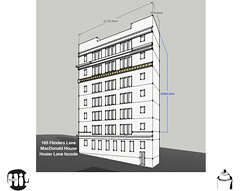 The plant room in the proposed building will be on level 9 which is directly opposite all the buildings on Flinders Lane and will cause vibrational impact on the heritage surfaces of these buildings — no reference to this type of noise or vibration issues are given in the proposal, so it has not been thought about with reference to impact upon existing buildings. No consideration has been made for possible future developments on the adjoining property known as Cavendish House. Boundary walls include windows on all floors looking north. Consideration should be made to ensure these windows do not remove their rights to develop above the existing level in future. What is happening at ground level in the “cafe” zone is not available in the proposal in detail, so we will not know what is being planned until it is built — but it appears to be inconsistent with the existing use of the lane way. The few drawings that have been included indicate a misunderstanding of the profile of businesses that live & work in the lane way. We have a homeless medical centre that has been part of this lane way for over 10 years. It is of great concern to the community that this would be “homogenized” to accommodate a ‘cafe culture’ aspect to modify the community services provided. We cannot afford to compromise this important community service. While there is a real need for more hotel rooms in the CBD, there are 15 other hotels with planning permits in permission phase as this goes live — this hotel does not NEED to be built-in this lane way. This site could be used for a better purpose that adds to the area rather than imposing on it. There is opportunity to use this space to address the many issues that had plagued the area for years, such as waste management, providing space for artists to work and exhibit and educate visitors and young people etc. This is something that the community have requested for a while due to the poor waste management that is currently in place in this lane way. No idea of what this building will provide in the order of tonnes of waste and how it will be collected and who will be collecting it — and when? What sort of imposition on the community will this collection put on the neighbourhood and the council? What is this development creating as precedent for the future of Melbourne and are we selling our heritage out by allowing such ordinary purpose for this unique area — if there were several developments like this to occur in the lane way would it hold is unique organic feel or would it be lost to commercial plagiarism? There is an extreme duty of care in the hands of the planning department and this is not something to be taken lightly. Shadowing on Fed Square – this is distinct disregard for the current laws on shadowing of Fed Square and needs to be addressed in the height issue. In particular, the complete overshadowing of the Atrium will impact significantly on this ‘Winter Garden’ that is integral to the design of Fed Square. All other objections can be personal, subjective or a segue to any of the above, but please mention Heritage overlay, Heritage height or Heritage sympathy and you are on the right path. The opinions stated in the above outline are a reflection of the topics discussed at the meeting held last night. Thank you for coming to the meeting or being interested in Hosier & Rutledge Lanes & this community. We urge you to find out more about this development at a public meeting to be held 6.30pm at Misty this Tuesday night, the 11th of March. Please like and share to get the word out – come to the meeting and have a say. Art, Council, Development, Events, Hi! Hosier Inc. is pleased to announce this official PaintUp! project video by Michael Danischewski. Check it out. 2 days in and it’s looking great! Round one of PaintUp! is well under way. Final touches will be done on Tuesday. 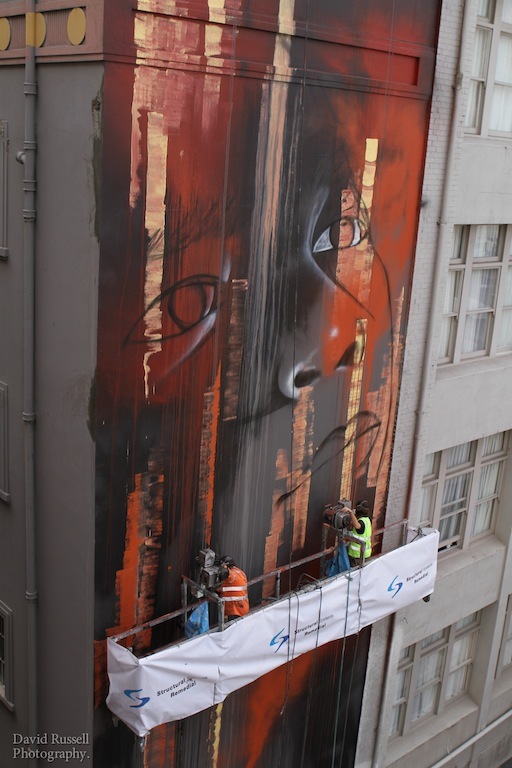 Over the next three days, Melbourne-based artist Adnate will transform Australia’s most iconic laneway, painting a significant wall that has never before been available to any artist. This is the first installment in a series of major artworks to be commissioned by local community association Hosier Inc. Paint Up! is part of an ongoing program of activities designed to activate the laneways and create a safe and engaging environment for all to work, live, visit and enjoy the area. “Everyone who loves and uses the lanes has a role to play in helping us maintain them, and they can all be a part of the association” said Luke McManus, Chair of Hosier Inc. “We see the art as a powerful instrument to activate the laneway in a positive manner – providing enhanced safety and unique experiences” he said. Paint Up! is funded by the City of Melbourne through their Annual Arts Grant program. Scheduled for later this year, Round 2 of Paint Up! will see an equally prominent wall being made available. The opportunity will be offered by open invitation and artists are invited to contact Hosier Inc to express their interest in participating. I am interested in participating. Please let me know when Round 2 of Paint Up! is open. 3. Confirm or vary the amounts (if any) of the annual subscription and joining fee. Owners of the Forum Theatre, Mariner Group have submitted another proposal for the redevelopment of the MTC site between Russell Street and Hosier Lane. The plans will see a 32-storey boutique hotel and office complex built behind the Forum on the derelict old MTC site. You can read about it in this article in the Age today. This will obviously have a huge impact on Hosier and Rutledge Lanes, both during construction and (more significantly) when it is complete. At this early stage it’s difficult to proffer an informed opinion about the design. It has been developed with little or no consultation or conversation with those who actually know and understand the community in which it sits. On the surface it seems a fairly typical and uninspired developer approach to this important site. The application centres around this being essential to facilitate the much needed refurbishment of the Forum Theatre, which has (conveniently) been left to fall into disrepair. The application was filed with the Victorian Department of Planning on Friday and the decision about the proposal will ultimately rest with Planning Minister Matthew Guy. Share your thoughts here. Hosier Inc would hope to be included in any future consultations. Hosier Inc (Association) is the recipient of an arts grant through the 2014 Arts Grants Program in the ‘Visual art / craft / digital media’ category. Contact Hosier Inc for details. Hosier Rutledge Lanes Steering Committee (HRLSC) met on the 18th of September in the Carlton Room – it was a full house with many events and items discussed! One of those was the CoM proposal to install a new laneway lighting design. Ian Dryden – Senior Industrial Designer for the City of Melbourne presented a set of slides of illustrations depicting the proposed catenary light design. 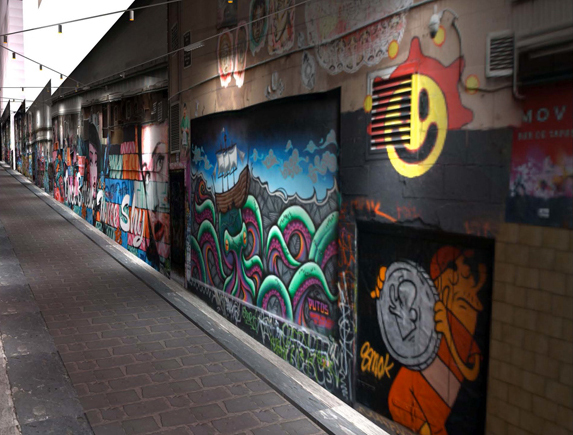 The Hosier Lane catenary system is based on two parallel cables in close proximity to each wall, with an additional zig-zag down the centre. The zig-zag provides support for the system, introducing the possibility of using lighter weight ‘cable’ connections to buildings, in lieu of heavy brackets. The intention is to create an outdoor gallery lighting system, to complement and enhance the space. The zig-zag of coloured leds down hosier lane introduces additional colour and visual interest to the space. Clusters of twin adjustable led spotlights accentuate artworks with medium beam, warm white (3000k) light. Discrete form and louvres combine to minimise the visual impact of the luminaire, and maximise the impact of the illuminated artworks. Multi-function ‘theatre-bars’ would be integrated into the catenary system at both intersections of rutledge and hosier lanes. Adjacent power supplies to be provided to allow the bars to be used for supporting additional special purpose lighting, speakers, banners or temporary art installations. The intent is to enhance the flexibility of the space, and enable the implementation of gallery style exhibition openings or other events in the laneways. The Rutledge Lane catenary system is designed as a minimised instance of the Hosier Lane system. The zigzag cabling incorporates the spot and linear lighting and fuses with the Hosier Lane system and the theatre-bars at the laneway intersections. In addition, linear led luminaires with a combination of wide and flood optics will wash the walls with warm white (3000k) light and provide quantitative lighting to suit AS/NZS1158 Category P8 requirements in both the horizontal and vertical planes. What d’ya reckon? We’d be interested to hear your thoughts and feedback regarding this design. Is it a missed opportunity? It’s not every day that a couple of lanes within a CBD get such massive exposure as has been evident of recent weeks. Following the courageous Rutledge Lane project entitled ‘Empty Nursery Blue’ by local artist Adrian Doyle the media has been abuzz with pics and stories about this modest space. Some love it, some hate it, but by and large, everyone who comes across it has an opinion or at least an exclamation. Its a good time to reflect on this project, and on the aims and hopes for the precinct generally. This recent article by Hosier Inc chairman Luke McManus on Vandalog gives a pretty good insight into the word on the streets. CDH’s sentiments do make sense coming from an artist’s standpoint and context. However, the question needs to be asked – is this precinct still a graffiti zone, or has it evolved to become something completely different? Experimental art or dare I say it – a viable art gallery for street artists? Nursery for graffiti – ummm. Is it still relevant to promote Hosier and Rutledge Lanes as graffiti lanes if one takes the illicit nature of graffiti seriously? Excursions of marker toting kids writing illicitly on walls as the teacher/s expound the wonders of the genre? Seriously – the idea of genuine graffiti in this precinct is dead. Time to move on. Even these taggers are able to restrain themselves when confronted by a Nolan or a Whitely at the NGV. So why is it alright to cap serious artistic endeavour in a public, sanctioned art precinct? Why is it ok to cap a business’ facade who has paid an artist for their time and creativity? Why is it deemed acceptable to climb a fence and down-pipe to tag over an 80 year old resident’s lounge room window? What role does graffiti have in our precinct? ‘Empty Nursery Blue’ was a blank canvas beyond one’s wildest dreams, but has it been squandered? Is it possible to activate and engage the art community in pursuit of a self-managed and iconic state? Not sure yet. The lane way has definitely been embraced by a small but fearless crew – a bunch of youngsters turning up early, late, all hours to hover and reclaim this holy Rutledge outpost. This is not a new occurrence, just a mutation of a traditional meeting spot. It’s an act of expression in a way, and one which leaves no piece uncapped – no fence un-climbed and no expletive un-said. Look out for them, and say g’day… but don’t expect mastery beyond a sneer and a backchat and a lazy tag over a fresh work painstakingly created by an artist who’s only just crossing Russell Street. Thankfully many works are preserved in time by photographers. Check out the imagery of Hosier Rutledge over the past month by captured by Hosier Inc member Dean Sunshine. Andy Mac must be wondering what cyclone hit his City Lights light boxes. Many of the adjacent businesses are miffed – and have a lot less faith in street art than that of Hosier Inc. However, with the burgeoning membership, new and supportive residents along with help from the City of Melbourne (because we don’t have the funds yet to do it ourselves) the many day to day problems will be addressed, such as the light boxes, and soon we hope. A swathe of new paint-ups will re-fresh again, but our hope is with greater longevity and a healthy discourse about what CBD lane ways can be. Let’s not confuse the issues. ‘The City of Melbourne recognises the importance of street art in contributing to a vibrant urban culture.’ Naturally. Graffiti on the other hand, needs to be managed, just as the City of Melbourne’s Graffiti Management Plan outlines. This is not really the raison d’etre of Hosier Inc, but it serves as one contributing factor in our efforts to maintain some semblance of order in the lanes. We hope to encourage contributing artists with ongoing support – not just with wall space, but also with materials and equipment. It just takes a little time and discussion to create and sustain something amazing. And just a little cash. We’ll keep you posted.